It was another good weekend. We headed to Maine after work on Friday and awoke to a perfectly blue sky on Saturday morning. It was chilly. In fact, the temperature was only 43 when Howard took Bella on her morning walk. Brrrrr. That’s a little cold for the first week of August! This weekend was the Maine FiberArts Tour. I had read in the local (Maine) paper that there were two farms open for visiting in New Gloucester, so we went to see. First, we visited Acker’s Acres Angoras, where Beth has about 100 angora rabbits, and she spins their hair into yarn. I bought a skein and can’t wait to make a very soft scarf for the winter. Next, we visited Betsey Leslie at Ewes to You. She was a very interesting person. She gave us an in-depth tour of her farm, walking us through the entire process from sheep to fleece to yarn. We met her 8 Border Leicester sheep, two parents and 6 offspring. She does everything by hand and had demos of her dying, carding, and spinning processes. She had a wonderful color palette, and I couldn’t resist and bought a skein of Spring Tweed, a blend of gold, blue, and green. 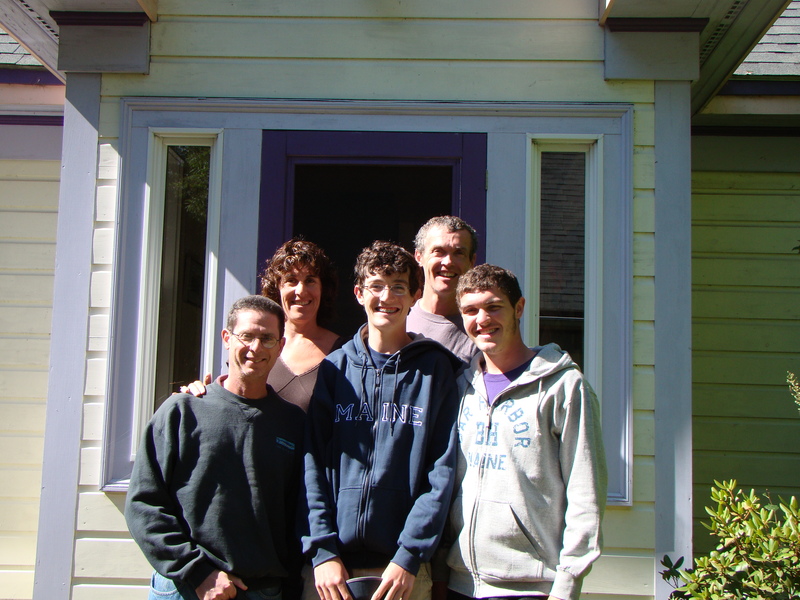 Shortly after we returned home, my cousin Debbie and her family returned from their trip to Acadia. We spent a pleasant evening hearing about their week of adventures. I gave Debbie a cooking lesson, teaching her to make last week’s guacamole. Then we all shared a dinner that everyone pitched in to make. Howard made the burgers. Debbie shucked the corn and made the salad. Scott sautéed the zucchini and summer squash. Michael made the salad dressing. Kyle kept us company. I guess I didn’t really do anything except supervise. After dinner, Scott, Kyle and I played Monopoly, and Scott creamed us. Fortunately, we set a time limit on the game, as Kyle and I were going down fast. I took advantage of having company to make a Blueberry Bannock Scone for breakfast. In the past month, we’ve picked 3 or 4 quarts of blueberries from the bushes at our house in Maine, mostly from one abundant bush near the dock. Our blueberry picking is relaxed, home turf foraging, not a dramatic mother/child separation tale (human and bear) like my childhood favorite book, Blueberries for Sal, by Robert McCloskey. Mostly we’ve been eating them for breakfast with melon or yogurt. I wanted to make this breakfast cake, which is baked like a cake, but you cut it into wedges. 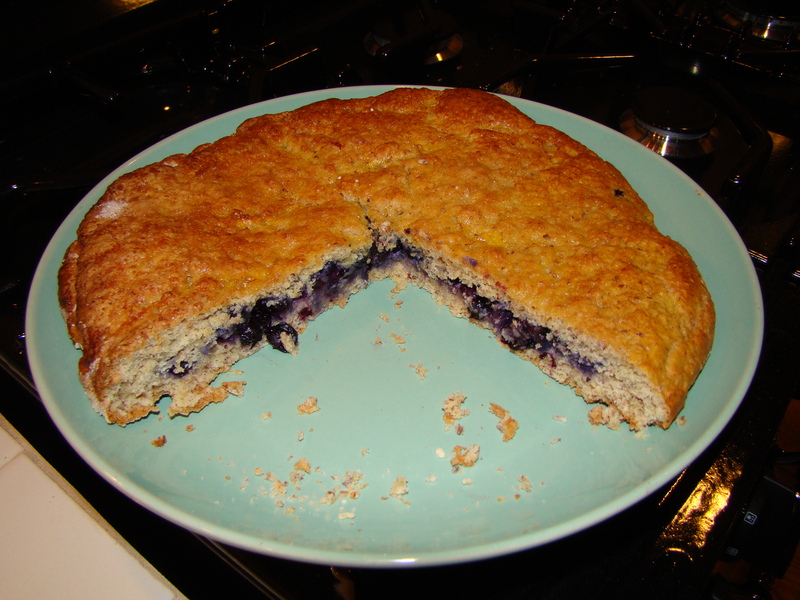 It isn’t very sweet and has the texture of scones with a blueberry filling. It seemed like the perfect thing to make for company, especially because it’s not something that Howard would ever eat and not something I need to each all of! Preheat the oven to 400F. Sprinkle a baking sheet with flour (to prevent sticking) and set aside. In a large bowl, combine the flour, almonds, wheat germ, baking powder, salt, cinnamon, and 2 Tbsp of the sugar. Rub the butter into the flour mixture with your fingers (or cut in with a pastry blender or fork), until it has the consistency of small crumbs. In a small bowl, whisk together the buttermilk with 1 of the eggs. Add to the flour mixture and stir until just moistened. The dough will be wet and sticky. Divide the dough in half. With well-floured hands, pat one half into a 9-inch circle on the floured baking sheet. Spread the blueberries over the circle, and sprinkle with 2 Tbsp sugar. On a lightly floured piece of wax or parchment paper, pat the rest of the dough into a another 9-inch circle. DON’T FORGET TO FLOUR YOUR HANDS. Carefully place the dough on the wax paper on top of the dough with blueberries, like a sandwich. Gently press the edges together. Beat the remaining egg with 1 teaspoon of water and brush the egg wash over the top of the scone cake. Sprinkle with the remaining 1 Tbsp sugar. Bake until cake is golden brown, 20 to 25 minutes. Remove from the oven and cool. Once it’s cool, you can cut into wedges and serve. Posted on 8 August 2010, in maine and tagged berry picking, maine, scones. Bookmark the permalink. 3 Comments. Ooh, angora rabbits! I’m reminded of my little niece who was very excited last weekend – they went on a class trip to a farm and held a little rabbit for the first time – she wouldn’t stop talking about it! PS: Finally tried your potato salad this past weekend. It was excellent. Another keeper! Hi Wendy! Sorry about that. I updated the recipe. You use 1/2 cup buttermilk. I love the potato salad. I need to post it at some point. Happy cooking!